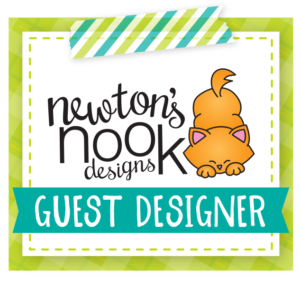 It’s a new challenge Monday for Newton’s Nook Designs. 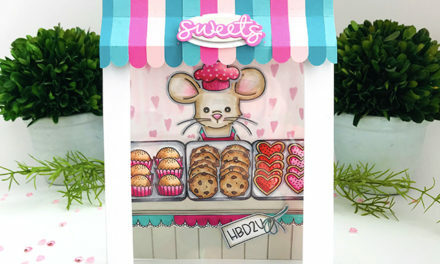 Check out Inky Paws Challenge for the new sketch #95. It’s got a banner design as part of the sketch. Here’s the card I created for inspiration for the challenge. 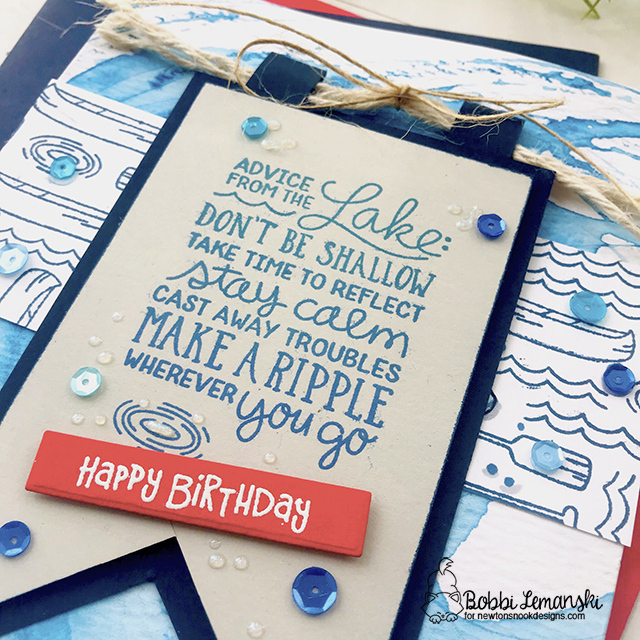 I used the stamp set, Lake Advice to make this one. The smaller designs in the set were used to create the strip design under the banner, too. I think this is such a cute phrase and definitely good advice for all of us! Since it’s from the lake, I wanted to give it a bit of a nautical feel so I used rope for the banner and a blue/red/white color combo. 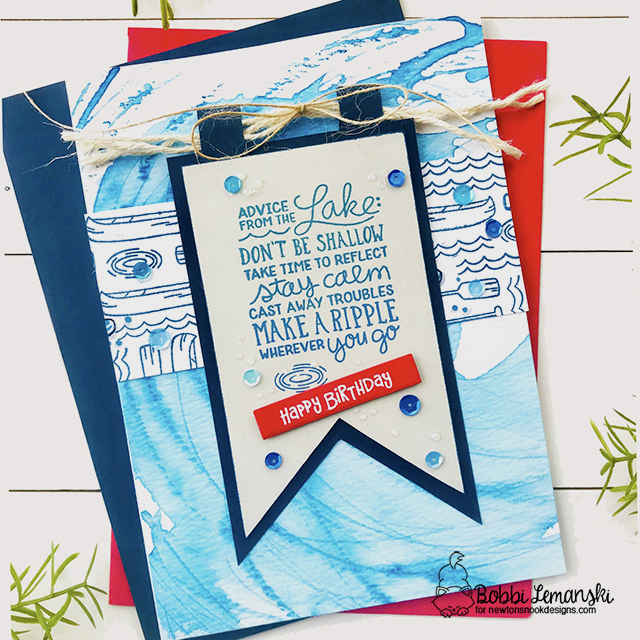 I also used watercolors in blue on Canson XL watercolor paper to create the water inspired background. A few sequins in blue were added to give the feel of raindrops. Plus, the sequins add a little sparkle, too! I added a few drops of Pearl Pen in clear to look like water drops to the banner. 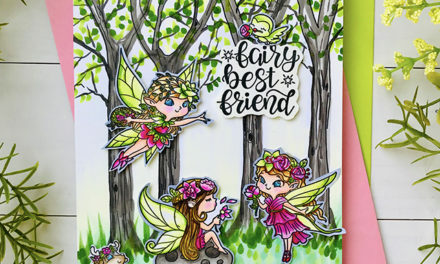 The “Happy Birthday” phrase is from the stamp set, Cocktail Mixer. I embossed white on red cardstock and adhered it with a little dimensional foam tape. 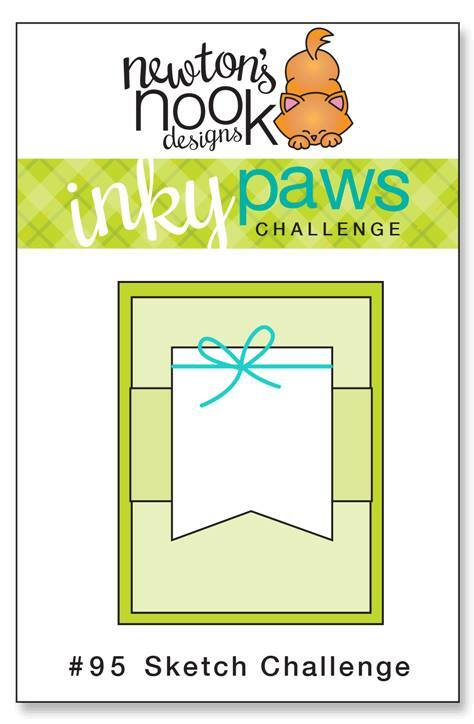 Join us for the Inky Paws Challenge #95. 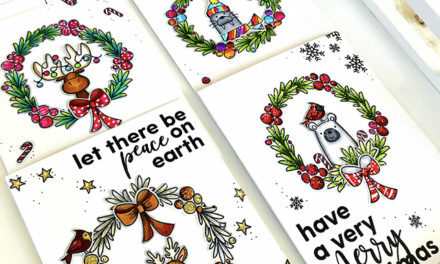 You have two weeks to link up your card for a chance to win a $20 credit to Newton’s Nook Designs. 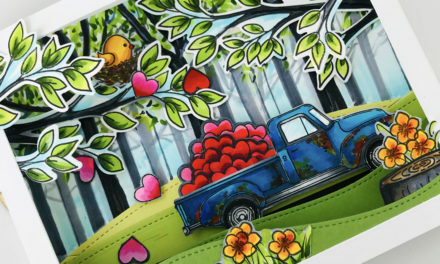 Your card should use a Newton’s Nook Design’s products to participate. It’s a smaller challenge which offers you a better chance of winning, too! Thanks for visiting! Take advice from a lake and have a great day! This is gorgeous! I love the colors and textures you used!